The last two big U.S. elections have rekindled discussion of voter fraud. There have been claims that non-citizens are voting, of people voting more than once, and of dead people voting. I wondered if any of these claims could be tested by analyzing publicly available data on voter registrations and history. To this end I have built some tooling around the Florida voter data. I looked for voters who are unusually old. I built a report that shows voters who have voted in Florida as supercentenarians. This list looks a little suspicious to me because only one of these voters shows up on Wikipedia&apos;s list of American supercentenarians. I looked for duplicate voters. There are lots of ways to do this. As a first attempt, I built a report that simply looks for voters who have the same first and last name, street address, and birth date. This finds quite a few people who are registered more than once, if they are the same person. In many cases, the middle name is different. Some of these cases may be twins, but that seems unlikely to me. In some cases, the potential voter has voted more than once in the same election. If these are indeed the same person, these are invalid votes. In many of these cases, the voter was voting under one voter ID and then switched to another. This is likely due to overzealous or sloppy voter registration efforts. The voter may not even realize that he or she is registered multiple times. At the very least, the duplicated registrations should be investigated and cleaned up by the local supervisor of elections. I noticed that the total number of unique votes is different when looking at unique counties in the vote history. That should not be possible as one cannot legally vote in two counties at once. I made a report that shows these double votes. 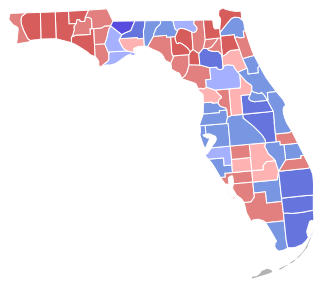 At the time of this post, the reports are using the data published on November 13, 2018 by the Florida Division of Elections. The reports will automatically update when newer data is published. An interesting meme in the gun debates in the United States is that “assault rifle” is a made-up term created recently by the left for political purposes (e.g., Twitter). Having encountered the term often enough in other contexts, I was surprised by this assertion. According to Google Ngram Viewer, which can search many older texts, the term was used as early as 1927 in “Infantry Journal”. It was used in many similar publications. The U.S. Army refers to the M16A2 and the M4 as “assault rifles” (   ). I am surprised this meme continues to exist when it is so easily discredited. That the term has been used for a long time gets mixed up with the fact that it is deliberately misused to create more confusion on this topic. By a pretty reasonable definition, no AR-15 clone is an assault rifle, as it has no fully automatic mode. Simple gun homicides and mass murders are executed effectively with semi-automatic guns. No assault rifle is necessary. The large round number stood out to me. I wondered how anybody could have counted so many laws. That seems a task that would require a lot of labor, collecting laws from the cities, counties, and states and enumerating them. It turns out that, as far as anybody can tell, this number was first stated by John Dingell, a representative of the Democratic party from the state of Michigan in testimony to the United States Congress in 1965. There is a description of his statement in “Evaluating Gun Policy: Effects on Crime and Violence”: “Consider the fact that we now have on the lawbooks of this Nation over 20,000 laws governing the sale, distribution, and use of firearms.” The study finds that “no additional references to the 20,000 figure appear in Dingell’s testimony, and no source for the estimate is given”. There is no reason to believe that he did not just make up this number. I am amazed that given Mr. Dingell’s long tenure in Congress, nobody ever managed to question him on this. Certainly, whatever interns or aides who worked on compiling such a number would have documented their work. Ronald Reagan repeated it in 1981. Charlton Heston repeated it in 1999. This has given it a boost and now it is repeated quite often. I have searched on social media for uses of this number (e.g., references to the specific and arbitrary 20,000 or 22,000 laws). I asked several of the people who use this number where they learned it, wondering if they read it in a book or just heard it on social media themselves. Many respondents report simply that they read it somewhere and that it makes sense because adding up all of the gun laws legislated by cities, counties, and states would be approximately that number. I find this interesting purely from a memetic point of view, demonstrating that people will rationalize their belief instead of evaluating it critically. Contrarily, the above mentioned study found that because “more than forty states preempt all or most local gun laws”, the number must be smaller. The study found that the number of statewide laws “may be as few as 300”. 53 years later people continue to repeat this number. The argument is completely valid without the fabricated number: “There are already many gun laws in the United States. How will adding more laws help?” But adding a number that sounds researched adds weight to the assertion. It&apos;s like a shibboleth for determining how likely someone is to assess a statement critically before repeating it. This number ripples across social media. The more it gets repeated the more likely it is to be repeated again without question. This is regrettable. We need more critical thinking on this topic and fewer memes blindly repeated. Because Dingell’s number is believable (nobody on any side of an issue would argue that the United States has too few laws) and tied to a controversial issue, it is a perfect meme. Poking around more with the Florida voter data, I found that of the over 13 million active registered voters in Florida, 2,254,591 of them have no history of ever having voted. 162,883 of those who have no history of ever having voted have recorded an email address when registering to vote. On Monday, November 5th, 2018, I sent them all an email asking them to vote the next day in the 2018 primary midterm elections if they had not already early voted or voted by absentee ballot. The data from the state is a mess. There are lots of typos in the email addresses. Some of the bad email addresses look like they might be a result of OCR failures. If I do something with voter email addresses again, I should run it through some simple transformations (e.g., “person@gmail.cim” should be “person@gmail.com”). A few people responded that they had moved out of Florida. Many people have responded positively. The few who have responded negatively to me via email have troubles with spelling, grammar, understanding how public records work, and the limitations of the CAN-SPAM Act. The positive encouraging responses far outnumbered the angry negative responses. Two people told me that I had changed their minds and convinced them to vote when they had already decided not to participate. Several people responded that they have voted in several Florida elections. I see none of those votes in the history. I am wondering if the history data is incomplete. I am going to have to investigate this further. A disturbingly large number of respondents do not understand how voting works. Some were out of the country and asking if they could vote by email or absentee ballot the day before the election. One person asked if it was necessary to have an ID card. Some people asked if they could just show up and vote. I responded with an enthusiastic yes and pointed out that they must already by registered as I have their data. Two people asked how to donate to my campaign. I am still trying to wrap my head around this. I do not know if I did not make it clear enough in my message that I am not running for office or if they thought I should run for office. A depressing number of respondents affirmed that not only had they already voted, they had voted entirely for a single party without apparent evaluation of the merits of the candidates. My mail server infrastructure did fine sending such a big burst. It did however consume lots of CPU while performing spam filtering analysis of incoming bounces for hours afterward. This delayed incoming email. I expected that I might end up on spam blocklists. In general, this did not happen. What did happen is that it appears that Gmail flagged my domain for sending to lots of invalid addresses and that gave my domain a bad reputation, preventing me from emailing Gmail afterward. I suspect a lot of potential Gmail recipients never got the letter. I had to fix my domain with Gmail. If I do something like this again, I will use proper mailing list infrastructure. This was really just an impulse decision for me, so I did not have any infrastructure in place. 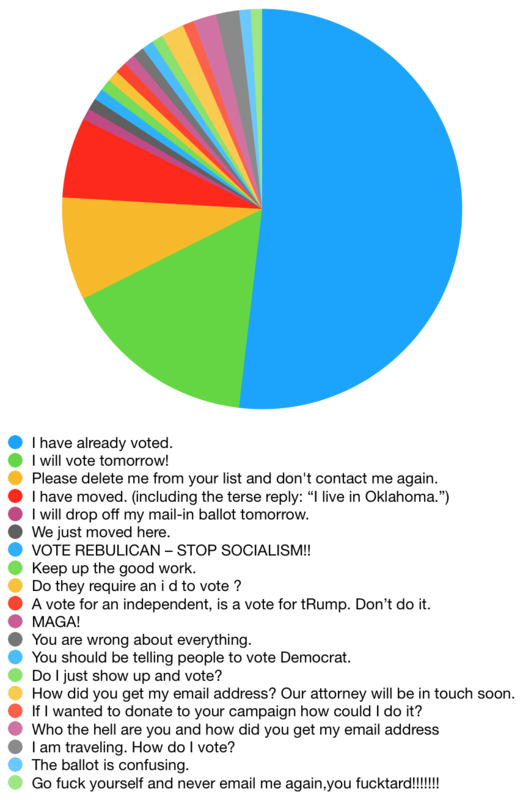 I have been tinkering around with ways of exploring voter data. I thought I would share some of what I find interesting in the context of the 2018 Florida midterms. One thing I am curious about is whether or not the results of the previous election will encourage more people to vote. The average age of new voters is younger than the overall voting base. It seems to me that could mean more young people are coming of age to vote and registering faster than retirees are moving to Florida. Personally, I am pleased to see an increase in No Party Affiliation. I think the two dominant parties have too much power. Hispanics are a bigger percentage of new voters. There has been some hypothesizing that we are getting more Hispanics from Puerto Rico as a result of Hurricane Maria. This made me wonder how the new Hispanics will vote compared to the Hispanics who were registered previously. The new Hispanic voters lean more towards the Democrats and no party affiliation than the already registered Hispanics. Because this data is from the latest extract, which is dated October 15, 2018 and only includes registrations up through September 30, 2018, it does not match the bookclosing reports. This data is slightly off from the numbers reported as of September 30, 2018.